NOTE: THIS MONTHLY MEETING IS SCHEDULED FOR THE 4TH MONDAY OF THE MONTH WHICH IS JUNE 24, 2019. THE WORKSHOP FOR THIS MONTH IS SCHEDULED FOR THE DAY AFTER OUR MONTHLY MEETING, WHICH IS TUESDAY, JUNE 25, 2019. With over 28 years experience, Korey Howell shares her "aha" moments and special business tools that have allowed her to experience year over year growth regardless of major changes to the photography industry. Korey Howell got her start in the photography business in 1990 with a mall-based glamour photography franchise company that she grew to 20 locations nationwide. Describing herself as a business person first and a photographer second, Korey now runs a luxurious head shot studio featuring two stories of natural light with state-of-the-art equipment. She often turns her focus to the community to support organizations such as Young Women’s Alliance, Girl Scouts of Central Texas, Komen Austin and The American Heart Association. NOTE: THIS WORKSHOP IS SCHEDULED FOR TUESDAY, JUNE 25, 2019 WHICH IS THE DAY AFTER OUR MONTHLY MEETING. 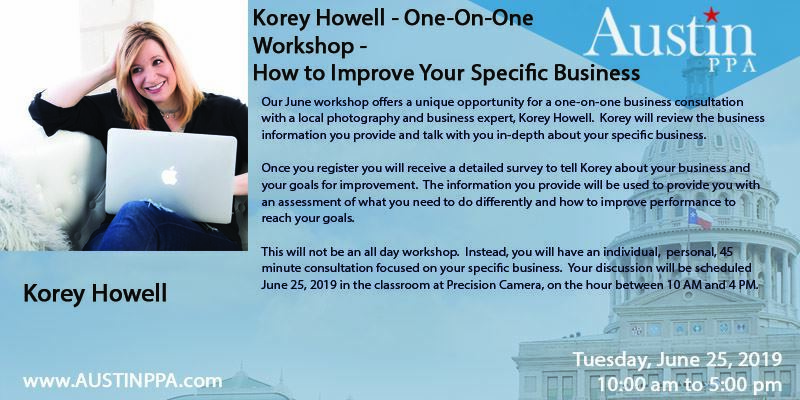 Our June workshop offers a unique opportunity for a one-on-one business consultation with a local photography and business expert, Korey Howell. Korey will review the business information you provide and talk with you in-depth about your specific business. Once you register you will receive a detailed survey to tell Korey about your business and your goals for improvement. The information you provide will be used to provide you with an assessment of what you need to do differently and how to improve performance to reach your goals. This will not be an all day workshop. Instead, you will have an individual, personal, 45 minute consultation focused on your specific business. Your discussion will be scheduled June 25, 2019 in the classroom at Precision Camera, on the hour between 10 AM and 4 PM. PPA Merit is pending for this event. NOTE: THIS MONTHLY MEETING IS SCHEDULED FOR THE 4TH MONDAY OF THE MONTH WHICH IS JULY 22, 2019. THE WORKSHOP FOR THIS MONTH IS SCHEDULED FOR THE DAY AFTER OUR MONTHLY MEETING, WHICH IS TUESDAY,JULY 23, 2019. It’s time to merge what you love with an actual salary! This requires stepping out of your comfort zone, defining your artistic voice, and understanding the worth of your unique skill set. We will discuss the steps to figuring your cost of doing business, as well as an honest look at the time it takes to create the finished products you’d like your clients to have. This will lay the foundations for finding, marketing, and selling the products that match up with your core values and photographic passions so that you can start making a Real Profit from Your Passion! The location for this class is Tim’s place located at 3434 Oxsheer Drive. The class is on Saturday, July 27, 2019 from 9 am – 4:30 pm with a break from noon – 1 pm for lunch. We will likely order pizza. We will be using Steve Kozak’s “CPP Study Guide” available at this link - http://photoproworkshops.com/Blog/cpp-study-guide/. Use the code “TPPA” for a $20 discount on the guide. The exam will be administered on Saturday, August 24th, 2019, from 9:00 AM to 12:00 PM at Precision Camera. Candidates can register for the exam by visiting http://ppa.formstack.com/forms/cpp_exam. Note that CPP candidates must be a member of the Professional Photographers of America to take the exam and participate in the certification process. PPA members who attend this class are eligible to receive one service merit from PPA. The instructor for this class is Tim Babiak, CPP. Tim serves as a local CPP Liason as well as on the Austin PPA Board of Directors. To register for the Certified Professional Photographer's exam from the national PPA, go to http://ppa.formstack.com/forms/cpp_exam. The exam will be administered on Saturday, August 24th, 2019, from 9:00 AM to 12:00 noon at Precision Camera. This class will be proctored by Tim Babiak, CPP. Tim serves as a local CPP Liaison as well as on the Austin PPA Board of Directors. A prep class for the exam is on the APPA calendar for Saturday, July 27th, 2019 from 9:00 AM to 4:30 PM. Note: This meeting will be on the 4th Monday of the month. 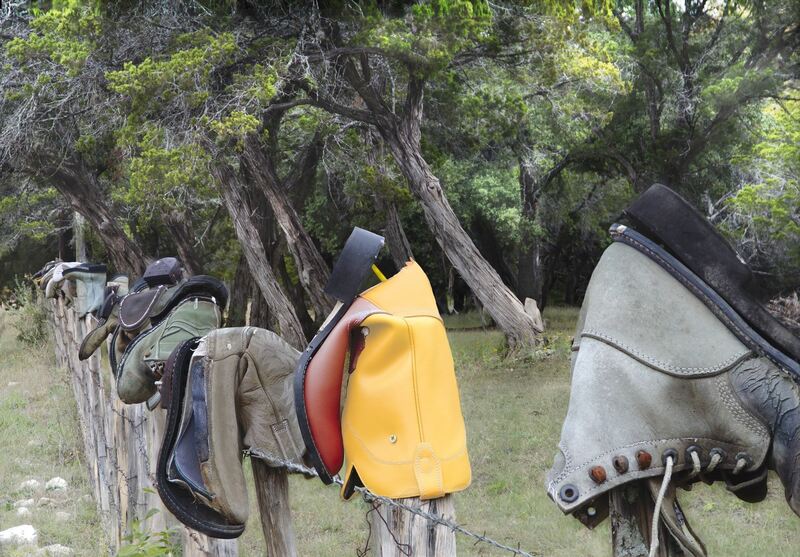 This month's workshop will be held at Valerie Kay Photography, 7113 Burnet Rd., Suite 109, Austin, TX 78757. The membership meeting will follow at 6:00 PM at Precision Camera and Video. Merely owning a camera does not make one a photographer any more than owning a pencil makes one a poet. A successful career in professional photography is built upon a foundation of lighting, posing and good business practices. Steve has helped countless numbers of photographers turn their passion into a profession and their photography into profits. With this class, you will gain a wealth of knowledge and a unique insight into creating images at a professional level.